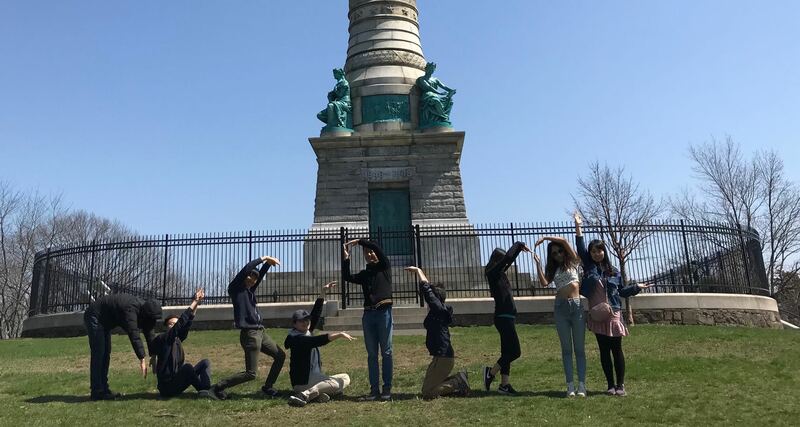 Spider is a large-scale complex and cross-domain semantic parsing and text-to-SQL dataset annotated by 11 Yale students. The goal of the Spider challenge is to develop natural language interfaces to cross-domain databases. It consists of 10,181 questions and 5,693 unique complex SQL queries on 200 databases with multiple tables covering 138 different domains. In Spider 1.0, different complex SQL queries and databases appear in train and test sets. To do well on it, systems must generalize well to not only new SQL queries but also new database schemas. 1/14/2019 The submission tutorial is out!. 12/17/2018 We updated 7 sqlite database files (issue 14). Please download the Spider dataset from this page again. 10/25/2018 The evaluation script and results were updated (issue 5). Please download the lastest versions of the script and papers. Also, please follow instructions in issue 3 to generate the latest SQL parsing results (fixed a bug). 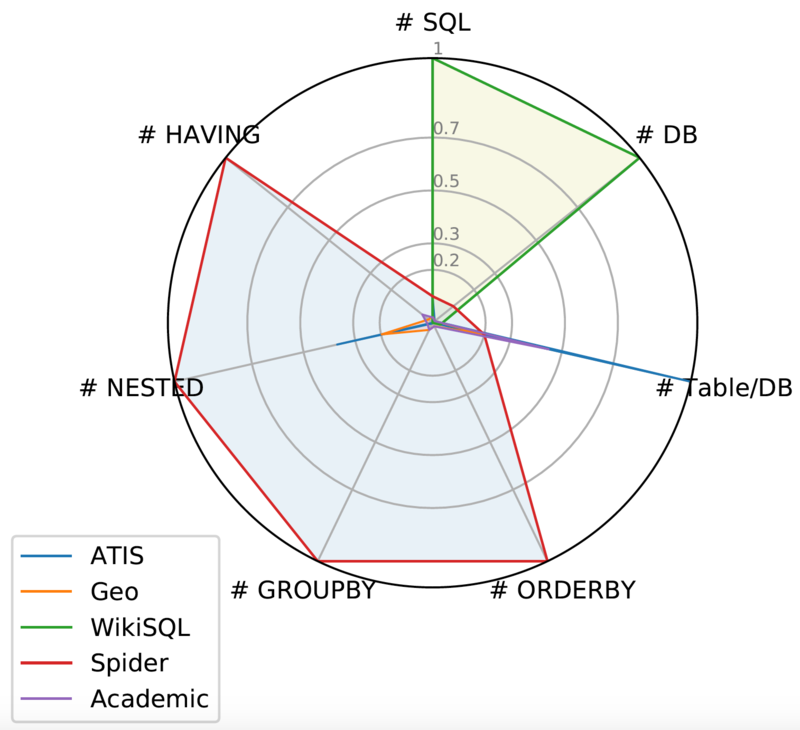 ATIS, Geo, Academic: Each of them contains only a single database with a limited number of SQL queries, and has exact same SQL queries in train and test splits. WikiSQL: The numbers of SQL queries and tables are significantly large. But all SQL queries are simple, and each database is only a simple table without any foreign key. Spider 1.0 spans the largest area in the chart, making it the first complex and cross-domain semantic parsing and text-to-SQL dataset! Read more on the blog post. Have Questions or Want to Contribute ? Ask us questions at our Github issues page or contact Tao Yu, Rui Zhang, or Michihiro Yasunaga. We expect the dataset to evolve. We would greatly appreciate it if you could donate us your non-private databases or SQL queries for the project. We thank Graham Neubig, Tianze Shi, Catherine Finegan-Dollak, and the anonymous reviewers for their precious comments on this project. Also, we thank Pranav Rajpurkar for giving us the permission to build this website based on SQuAD. For exact matching evaluation, instead of simply conducting string comparison between the predicted and gold SQL queries, we decompose each SQL into several clauses, and conduct set comparison in each SQL clause. Please refer to the paper and the Github page for more details. Our current models do not predict any value in SQL conditions so that we do not provide execution accuracies. However, we encourage you to provide it in the future submissions. For value prediction, you can assume that a list of gold values for each question is given. Your model has to fill them into the right slots in the SQL. Is your system going to the first one showing up on this leaderboard? For comparison, the models achieve much higher results if we split the dataset based on data examples instead of databases since the systems don't need to generalize to new database schemas.